Rainham Marshes Guest Blog: Rainham Silt Lagoons - Bill Gush, Regional Director, Land and Water Services Ltd. Guest Blog: Rainham Silt Lagoons - Bill Gush, Regional Director, Land and Water Services Ltd. Please find below a guest blog from Bill Gush, Regional Director, Land and Water Services Ltd.
An update on recent developments and future plans for the Rainham Silt Lagoons. 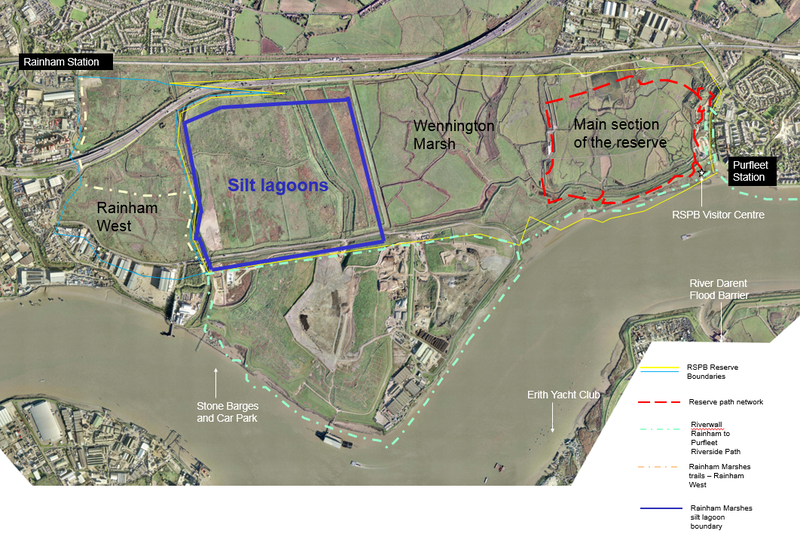 The silt lagoons at Rainham have long been a draw for wildlife, and due to their attraction to wetland birds and other wildlife, they were included in the Inner Thames Marshes Site of Special Scientific Interest (SSSI). The silt beds were formed as a result of river dredging. The Port of London Authority (PLA) used the lagoons for many years for the disposal of dredged material from the rivers Thames and Medway. The wet conditions allowed lagoons to form and wetland wildlife to flourish. The lagoons sit within the RSPB’s ownership, and will revert to being managed by the RSPB once the PLA has finished their operation and use of the lagoons. When the site stopped being used for the disposal of dredged material, the condition of the SSSI slowly began to change as it dried out and plants took hold, forming a rough grassland. This habitat was no longer suitable for over-wintering wetland birds but was instead favoured by raptors and invertebrates. With space still existing in the lagoons for dredgings, the PLA is now proposing to reactivate the lagoons for dredging disposal and they have appointed Land and Water (L&W) to operate the site. L&W will shortly be submitting a planning application outlining the future management of the site and a vision for its restoration after dredging disposal ceases. The application and plans will be advertised locally in the near future. The operations will involve initially creating habitats to allow dredging disposal to resume with minimum impact on the resident wildlife. The L&W plans also include a vision for creating new habitats, which will sit comfortably with the site’s SSSI designation for wetland birds and wildlife. These restored habitats are being designed in consultation with RSPB staff and Natural England to be long lasting and to complement their surroundings. Once the site’s been filled to the planned restoration levels and the various habitats created, the PLA will hand the lagoons back to the RSPB. The completed habitat will be a self-sustaining mosaic of wetland and higher land with a variety of flora species. The variation in land elevations and ditch systems, along with the use of permeable and non-permeable near surface restoration materials will help create drier sparse habitats in the higher areas, and a wetland habitat in the lower area, recreating much needed lost landscapes along the Estuary which support wetland and over-wintering birds; for which the site was originally designated.